Since today is the fiftieth anniversary of the JFK assassination, there is much in the news media about that event. Rather than focus on that episode, we present a) the photo you see of Kennedy as a senator speaking at UCLA in 1959, and b) a Dictabelt recording of Kennedy talking on the phone as president to Governor Pat Brown and son Jerry Brown in 1962. Some background: Various recording technologies were in use in the early 1960s. Tape and wire recorders were introduced in the period after World War II. (Germany had made advances in magnetic recording which were captured as part of the American invasion and then made available to U.S. manufacturers.) But there were other needle-in-groove technologies used for dictation machines that co-existed for a time with magnetic recording. Among them was the Dictaphone Dictabelt machine which recorded on rotating plastic cylinders and was an updated version of the older Edison Ediphone. (Google “Ediphone” if you are unfamiliar with those machines.) When the White House tapes were discovered as part of the Nixon Watergate affair, it was later revealed that there had been similar recording under Johnson and Kennedy. Those earlier administration recordings are now available. 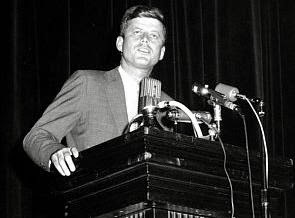 Some of the Kennedy recordings were made using Dictabelts rather than tape. Because the recordings are needle-in-groove, there is a tendency for the needle to skip and repeat. Such recordings were not intended for long-term archiving and could be easily damaged. Below is a link to a conversation between Gov. Pat Brown and JFK shortly after Brown had defeated Nixon for governor of California in Nov. 1962. After that contest, Nixon gave his famous speech in which he attacked the news media and said you won’t have Nixon to kick around anymore. At the time, it was assumed that Nixon’s political career was over, thanks to his bitter speech. On this Dictabelt recording, Pat Brown opines that Nixon is a paranoid and then puts young Jerry on the phone so he can talk with the president. You have to listen carefully because of the needle skipping and resultant repeats.